Thomas Roofing is a family run professional and reliable business established in North London for over 25 years, we cover all aspects of roofing work such as tiling, guttering, fascias, soffits and barge boards. All our work is completed to the highest of standards and is guaranteed, so that you the customer can be assured that you are getting the best possible service. We are registered members of “The Guild of Master Craftsmen, The Fair Trades Association and The Confederation of Roofing Contractors”. So why not try our top class service for yourself and join the list of satisfied customers. 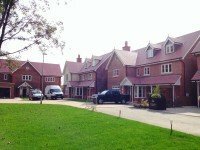 Whether it is a single tile that has blown off your roof or a complete Roof retile you require, Thomas Roofing are happy to call and provide a free quotation, just fill in our contact form. Slate roofing provides a more traditional look for many older style properties, there is a choice of natural or synthetic depending upon the colours required. We can source reclaimed slate to repair broken or missing tiles. In poor weather the lead work around chimneys can deteriorate causing water leaks, we can provide a full replacement service which will involve the removal of the old lead, and replace with correctly coded new lead, replace any leaking tiles and have the chimney bricks re pointed. If your roof has started to sag or sink in places, we may be able to help extend its life with a strip and re-tile service, saving on the cost of a replacement roof. We can strip off all the existing tiles, fit new battens, add a waterproof felt membrane, before re-using the existing tiles, fitting new hip and ridge tiles and replacing any broken or missing tiles with reclaimed tiles. Enquire about this service today by completing our contact form. We have a skilled and experienced team and aim to complete every project to the highest standard. We are fully insured and all our roofing work comes with a comprehensive guarantee of either 10 or 25 years depending on the project and materials used. Thomas Roofing replaced my whole roof & recovered the bay window roofs. They also replaced small sloping roofs over our porch and kitchen areas. We found them to be efficient, professional & trustworthy workers who made little noise! They cleared up regularly & left our property tidy & clean. There was an issue about a heavily laden skip but this was resolved satisfactorily. Several neighbours have commented positively about the roof and the workers. I am happy to recommend Thomas Roofing.